Your diet directly affects your health, including the health of your circulatory system. Over time, a diet high in fat and processed foods elevates your cholesterol levels. High LDL cholesterol, the bad cholesterol, is one cause of atherosclerosis, a hard plaque that builds up in your arteries, narrowing them and impeding proper blood flow. Atherosclerosis increases your risk for developing heart disease and stroke. The good news is that a heart-healthy diet helps clean plaque from your arteries, improves blood flow and keeps your circulatory system working properly. Ask your doctor about Dietary Approaches to Stop Hypertension, or the DASH diet, to help improve your circulatory system's health. The American Heart Association recommends at least six servings of whole grains daily. Steel-cut oatmeal, oat bran, barley and rice bran are whole grains containing soluble fiber, which binds to excess LDL cholesterol in your digestive tract and allows it to pass from your body. Whole grains also give you magnesium, which acts to dilate blood vessels, keeping your blood pressure healthy. 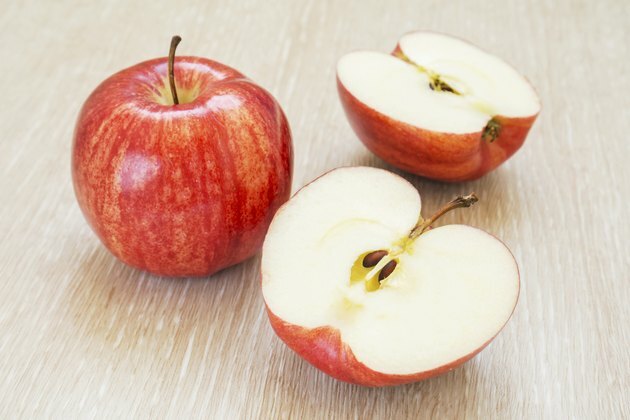 An apple a day may keep the doctor away. Some fruits also contain soluble fiber to help to clean your arteries. Add four to five servings of apples, pears, bananas, prunes or oranges to your diet for their LDL cholesterol-lowering properties. These fruits also provide potassium, which can lessen the effects of dietary sodium on blood pressure. Vegetables contain compounds called plant sterols, which work in the same way soluble fiber does to whisk away harmful LDL cholesterol from your body. Enjoy three to five servings per day of a variety of deeply colored vegetables, including sweet potatoes, broccoli and carrots. Vegetables contain potassium, which can counter salt's ability to raise blood pressure. Dark leafy greens, such as spinach and kale, provide magnesium, which is important for blood pressure regulation. Soluble fiber is also found in legumes, a type of fruit grown in a pod. Have three to four servings of legumes each week. Include lentils, kidney beans, lima beans, chickpeas or soybeans in your diet to meet that requirement and help remove LDL cholesterol from your system. Oily fish contain super-healthy omega-3 fatty acids, which can help reduce inflammation in your arteries. Inflammation is one of the causative factors of plaque formation in your arteries. Eat two servings of salmon, halibut, mackerel, albacore tuna or lake trout weekly. You require 3 ounces to 6 ounces of protein each day. Grill or bake lean meats, such as chicken and ground turkey, to avoid adding unhealthy saturated fats to your meals. Limit your intake of any red meats because they are high in saturated fat, which may contribute to plaque formation. Select low-fat and fat-free dairy products instead of the full-fat varieties containing saturated fats. Dairy products provide calcium, which helps regulate your blood pressure and keeps your muscles functioning properly. Select skim milk, as well as low-fat and fat-free varieties of yogurt, cottage cheese or cheese, to fulfill the two to three dairy servings you need daily. Heart-healthy oils also contain omega-3 and omega-6 fatty acids, which help prevent plaque formation. The healthy oils include olive oil, sunflower oil, safflower oil and canola oil. Olive oil also boosts your levels of HDL, the good cholesterol, which helps reduce plaque formation in your arteries. Substitute these oils for butter when cooking to get your two to three servings per day. Water is fine, but avoid all juices and processed drinks containing sugar. Black teas and red wine contain flavonoids, phytochemicals which protect your arteries, according to Merck Manuals. Have no more than one glass of red wine per day if you are a woman and two if you are a man. National Heart Lung and Blood Institute: How Is Atherosclerosis Treated?